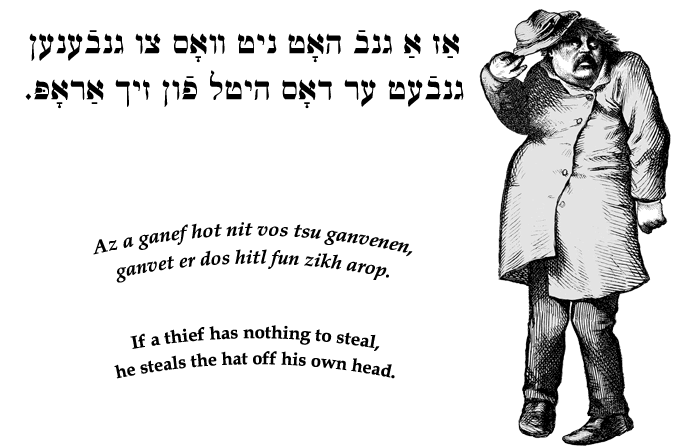 Yiddish Wit: If a thief has nothing to steal, he steals the hat off his own head. אַז אַ גנבֿ האָט ניט וואָס צו גנבֿענען גנבֿעט ער דאָס היטל פֿון זיך אַראָפּ. Az a ganef hot nit vos tsu ganvenen, ganvet er dos hitl fun zikh arop. If a thief has nothing to steal, he steals the hat off his own head.